I believe we have sold more of this country print then any of the others. People seem to connect with the bright light coming through just after the shower passed in this quiet rural scene in this painting.. 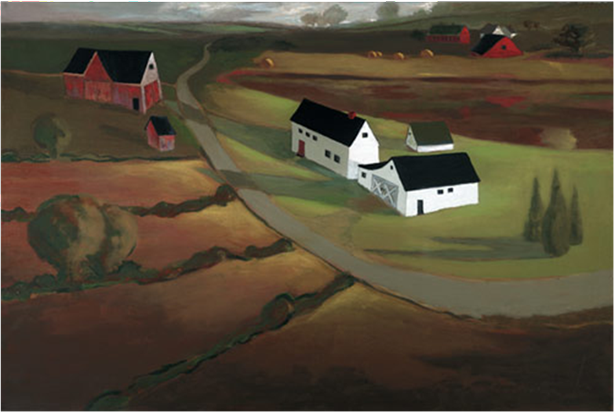 The colors, the richness of the earth and the cluster of barns almost feel like a group of friends gathered together. The watercolor paper makes a beautiful image that enhances the contrast and colors in this folk art print. 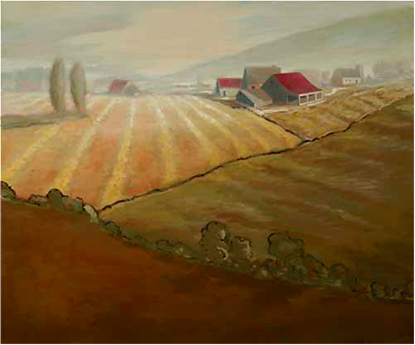 The tinting creates the distance with a haze in the background leading up to the country sky on this peaceful farm. 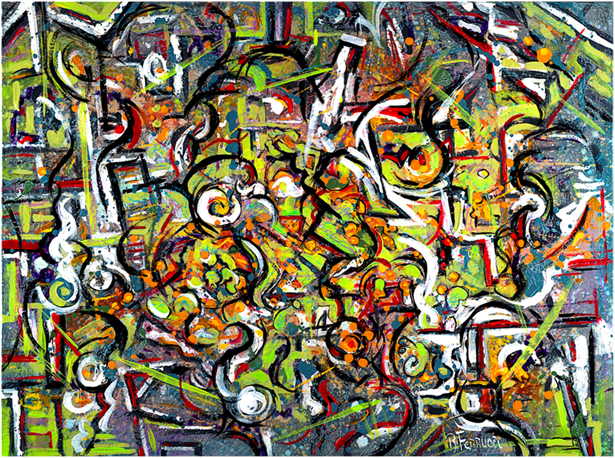 This is a fun abstract painting that has both a strong left to right flow and an intermittent vertical movement. A blue slate background with energetic black lines moving vertically with turns and lines give it a strong, lively feeling. 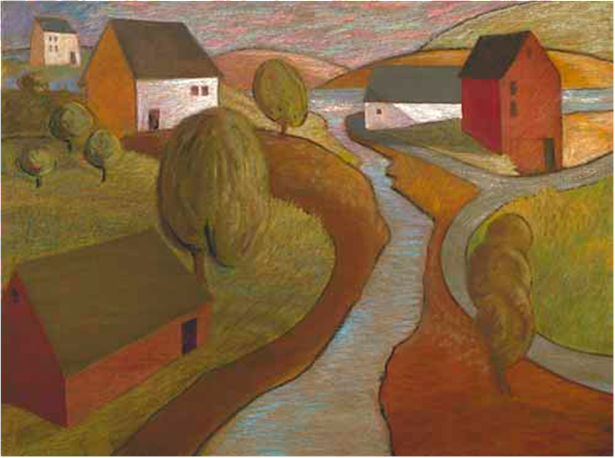 The vibrant greens create the left to right dynamism and the red hues help to separate the two ideas. As in most of my work, you will find plenty of tinted colors and layers of painting with a lot of brush work on the surface to control the movement and help the eye travel the width and breadth of the painting. The strength of the lines and the shapes give it the mechanical feeling and power. 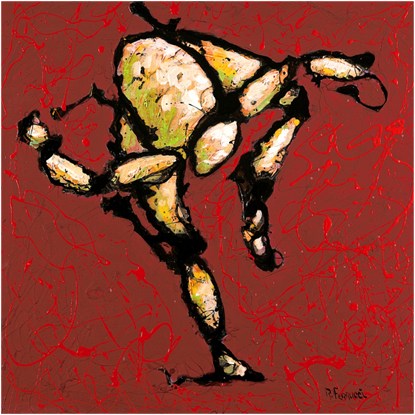 This is another abstract painting where movement is the key. In this drip art painting I wanted to move around the canvas- falling off the edges but continuing the movement. It has a powerful feeling like a wave or storm at sea. The change in colors and shapes from left to right are dramatic and seem to get deep like a dark ocean on the right side. 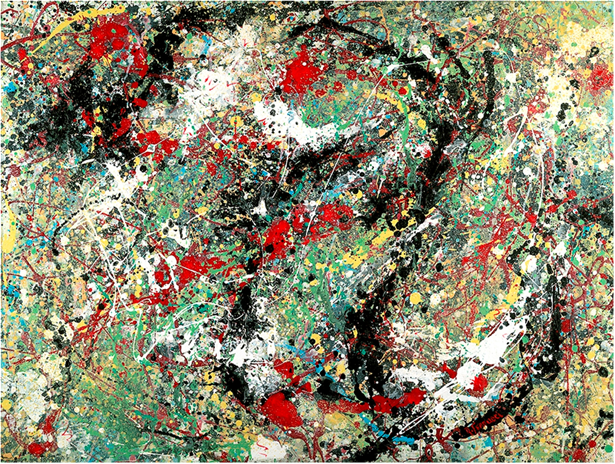 Dripping and splashing the paint and layering over and over creates the overall feeling of the painting which is similar to the work of Jackson Pollock. This is a fun painting. 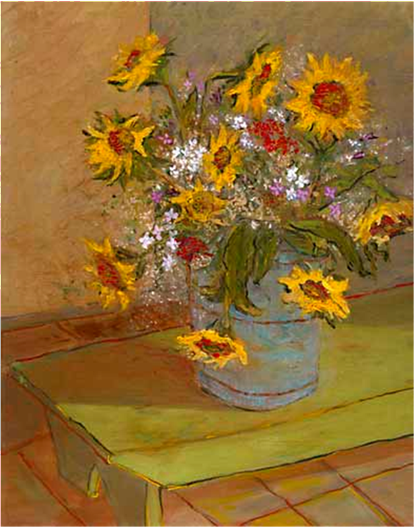 The funky sunflowers, the container and the green bench give an American Folk Art look with bright colors. As with most of my work, the tinting helps brighten the light areas and enhance the shadows in this slightly primitive style original artwork. When framed in a dark wood with a little gold trim and a white matte, the colors seem to brighten even more. 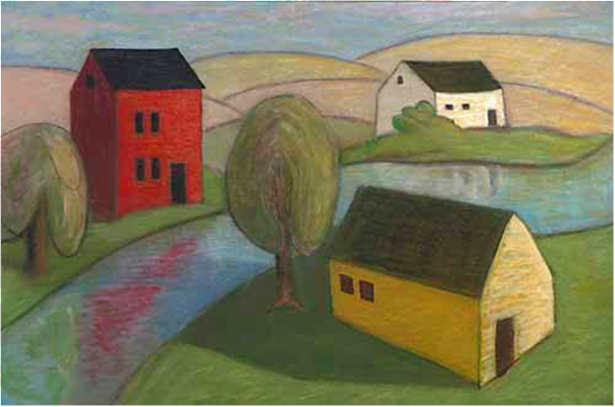 This painting depicts a little red cabin in the Adirondacks that we pass on the way to our summer camp. There are tiny country cabins all along the river. The bold folk art shapes and bright oil pastel colors give this painting an innocent childlike look. It looks a little like crayon and goes well with the technique and the primitive effect I’m looking for. It’s fun, simple, bright and cheerful. It tells of a simpler uncomplicated time. My effort here was to create as much movement in this drip art painting as I could. I wanted the paint to move around the canvas, falling off the edges but keeping the movement even after going off the edges. The whites and reds break the movement but not enough to stop it, and green creates a center background that helps the painting balance. 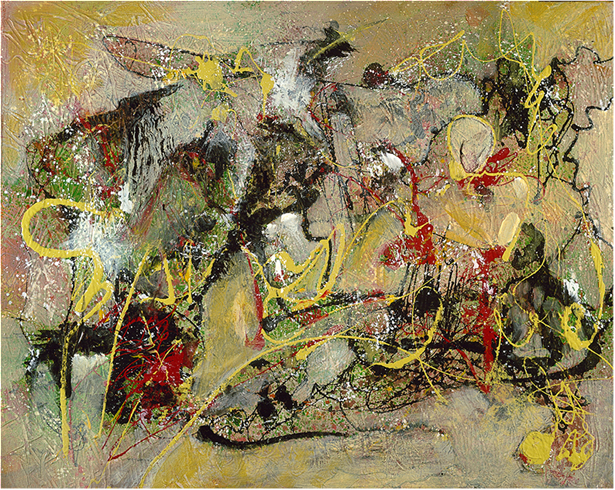 Bits of yellow throughout this abstract painting are just enough to help the motion in a jetting way. 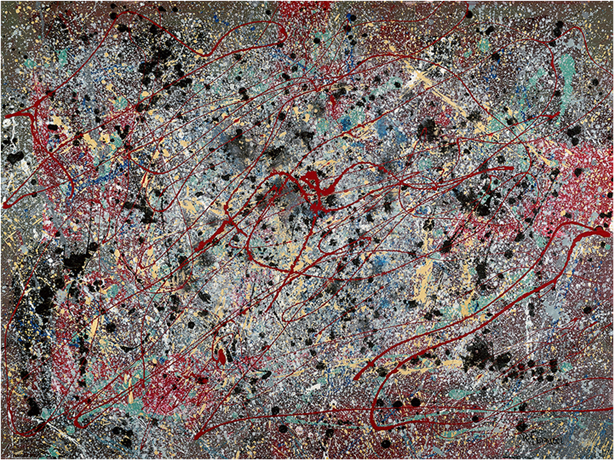 It was inspired by the work of Jackson Pollock. I like it. I hope you do, too. 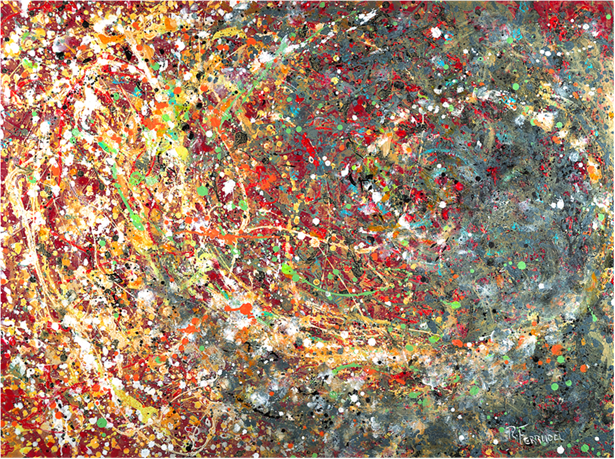 Be sure to click on the painting to see a slideshow of my other abstract expressionism and drip art paintings. This is a good example of different techniques combined in one abstract painting. The canvas was prepared with a strong layer of gesso. The end of a brush and other blunt tools were used to create a gold and green pattern on the first surface. Next, colors covered the gesso and a tint was laid over the different colors. There is a lot of brush work and dripping and splashing, Jackson Pollack style, on this painting. After drying, I used more tinting and brush work, and then repeated the same process again with different bright colors and tints. The final layer involved more brush work and dripping and splashing some bright white and dark blacks, reds and bright yellow for highlighting. Look closely and you can see the patterns underneath everything in the gesso. I enjoy reading about quantum physics, the size of things, entanglement, and other ideas about the universe and space. I have done a series of drip art paintings with this motif and am still working on more of them. 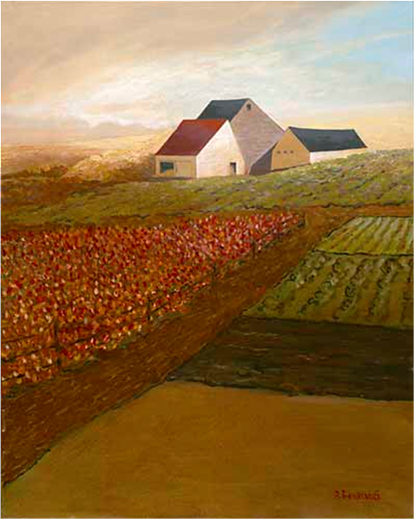 Some people see a lot of Jackson Pollack in this work, but the paintings are really a lot different from Pollack’s work. I have studied his work and love it and feel honored that anyone would feel that way. But the effort here is to give a more dimensional look to the canvas by using a base color or colors, then adding some work to the canvas with dripping, splashing and brush work. That creates a gray background surface for tinting. Then, after drying, I work the canvas again and again adding blues, yellows, reds and blacks. The last layer is always brighter and clearer than the one before it. If you look closely at these abstract paintings you can detect the layers under the surface and it reveals some of the technique involved. The story that inspired this bright red abstract painting began in a diner off of I-84 in CT. I was sitting at the counter. It’s not the type of thing I usually do. I think I was just getting a coffee and piece of pie when a young man about 40 came in. He sat next to me with, of course, one empty stool between us. I looked over and said, “Traveling light?” He had a small rag type bag over his shoulder, that was it, but for some reason it looked as if he was traveling. “I guess so, just coming back from a long trip.” “Where were you?” “I spent the last year walking around the country with an Indian Tribe.“ “Really? And why did you do that?” “My wife and I broke up a few years ago and I guess I was looking for something and I think I found it. We walked from one end of the country to the other stopping to talk, eat, think and pray. At the last stop we built a big fire they called it the fire of forgiveness.“ “Sounds as if you found everything you needed.” “I hope so. I’m going to see my ex-wife and tell her I’m sorry and ask her for her forgiveness. Don’t know if it will be given to me but I’m willing to try.” The painting depicts that scene with bold, contrasting colors defined in black, yet the scene is optimistic of the future.